After getting pushed back numerous times, it looks like Iron Sky 2 will officially premiere early next year, and to celebrate, 9 Media has released an extended trailer that is over 5 minutes in length. 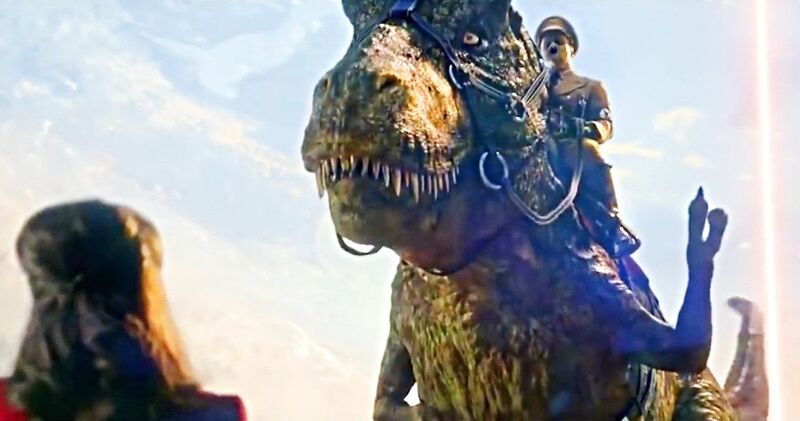 This is, by far, the best look at the long-awaited sequel that we have seen, and it’s completely bonkers, showing the reptilian Hitler riding a T-Rex through the Hollow Earth. The Finnish-German comic science fiction action film is directed by Timo Vuorensola, who also helmed the first installment back in 2012. Earth is shown being destroyed in the new Iron Sky 2 extended trailer and then the president of the United States, who is also a reptilian, is led to the Hollow Earth and greeted by reptilian Hitler sitting on top of a T-Rex. The special effects look ten times better than the original film and they are really, really good. In addition to receiving money from The Finnish Film Foundation and Medienboard Berlin-Brandenburg, Timo Vuorensola also ran two successful crowdfunding campaigns to raise funds for the special effects. It’s estimated that the film cost over $15 million to make. Iron Sky 2, aka Iron Sky: The Coming Race, is set twenty years after the events of the first movie, and the former Nazi Moon Base has become the last refuge of mankind. Earth was devastated by a nuclear war, but buried deep under the wasteland lies a power that could save the last of humanity, or destroy it once and for all. The truth behind the creation of mankind will be revealed when an old enemy leads our heroes on an adventure into the Hollow Earth. To save humanity they must fight the Vril, an ancient shapeshifting reptilian race and their army of dinosaurs. Initial filming for Iron Sky 2 took place in 2014 and then again in 2015. Post-production started in 2016 and the sequel has been in a bit of limbo since then. Director Timo Vuorensola started crowdfunding campaigns to earn extra money for the visual effects and then was involved in a lawsuit in 2017 over copyright by the VFX team. In the end, the judge sided with Vuorensola and Blind Spot Pictures. Teasers for The Coming Race have been posted over the years, but the release date keeps getting pushed back. Iron Sky 2 was supposed to premiere this month, but it has now been pushed back to January 16th, 2019. Let’s just hope that date sticks this time around because fans of the first film are starting to worry that it won’t ever come out. However, this new extended trailer should help bring hope to all who have been anxiously awaiting any updates about the project. You can check out the truly bizarre extended trailer for Iron Sky 2 below, thanks to the 9 Media YouTube channel.